If you want to keep a record of the comparison of employee preferences to their assigned shifts, ex. before you Publish, you can use the Sortable List>Analyze feature and then print that to pdf. If there is ever a question later regarding preferences and shift assignments you will have that as a record. 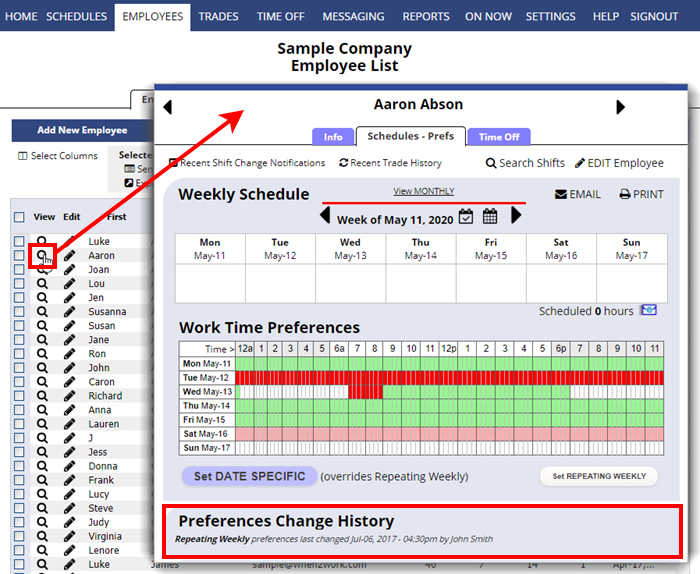 We also provide a “last edited” date for when each employee’s preferences were last updated and a notation about who made the change in the “Preferences Change History” section of the Schedules/Prefs tab. Also note that you can set up to be notified when an employee’s preferences are updated on your SETTINGS>My Notifications page, and then you can use the Analyze feature to see if the new preferences conflict with already assigned shifts.